Obituary for Ralph Lawrence Elsey, III | Jolley Memorial Chapel, P. A. 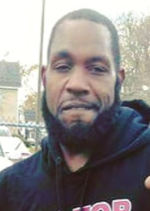 Snow Hill - Ralph Lawrence Elsey, III (Bigg Elsey), 40 died Saturday, April 7, 2018 at his Snow Hill home. Born in Salisbury, MD, he was the son of Renita (Fisher) Marshall of Snow Hill and the late Ralph L. Elsey, Jr. He attended Snow Hill High School and was formerly employed in the Dietary Department of Snow Hill Nursing and Rehabilitation Center in Snow Hill. He was a member of Free Indeed Ministries in Snow Hill, MD. His community service included Football coach with the Snow Hill Youth Football, Salvation Army (East) Football and Baseball coach for the Snow Hill Little League. Besides his mother, he is survived by his wife: Shari Shockley-Elsey of Snow Hill; five children: Monica and Jasmin Elsey, both of Salisbury, MD, Dajsia Shockley, ShaMiaz and KyRien Elsey, all of Snow Hill, MD; one granddaughter: Tre’Moni Giddens of Salisbury, MD; Amonty Allen, whom he reared as his son of Snow Hill, MD; two sisters: Usheka Davis and Tanya Jenkins, both of Snow Hill, MD; one brother: Terrell Elsey of Denton, MD; a mother-in-law: Janice Shockley and grandmother-in-law: Elder Edith Shockley, both of Snow Hill, MD and several aunts, uncles, nieces and nephews. A funeral service will be held 11:00 a.m., Saturday, April 14, 2018 at Snow Hill High School, 305 S. Church Street, Snow Hill, MD. Interment will be in the New Mt. Wesley U.M. Church Cemetery in Snow Hill. Friends may view from 6-8pm, Friday, April 13, 2018 at Free Indeed Ministries, 418 W. Market St. in Snow Hill and again on Saturday at the high school, one hour prior to service.